Minced oaths are etymological landmines, and if I were a better guesstymologist I probably would not tread on this one; but if it is a coincidence it is too good to be true, so here goes. Dictionaries list darn and durn as euphemisms for damn(ed), and most of us take the words this way, as playful substitutions on the order of cripes for Christ or jeez for Jesus. Damn has had other substitutes in its day, for instance dem(n), and there is nothing strange about the slightly thicker disguise in darn. The question is whether darn and durn actually started life as euphemisms. If we are willing to accept a dash of dialect mixture, there was another way for them to make the acquaintance of damn, not at first with the stronger meaning of that imprecation but with its use as a watered-down intensifier. Eugen Borst in his study of adverbs of degree cites examples from Wright’s English Dialect Dictionary of the word down used as an intensifier, giving the forms dahn and doon: dahn weel seure, an even doon good shot; and of course with the normal spelling down: He’s a down bad’un. He adds an American example with right down: You’re right down splendid at explaining most things. In reverse order this is standard: downright foolish. Right of course is an intensifier that has had its day, but persists in a few set phrases: right reverend, right sharp, right smart. Given the parallel between darn-durn on the one hand and down-doon on the other, plus the uncertain status of English r when it comes at the end of a syllable, we see what may well have happened. 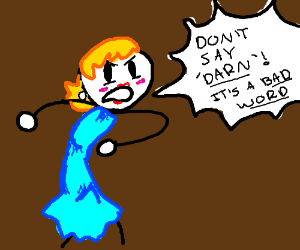 We start with an intensifier in I’m down well sure of it, give it an r-ful spelling, pass the hybrid on to a dialect where r is pronounced, and end up with two spelling pronunciations, darn and durn: I’m darn well sure of it. So what we have is an intensifier, down, which encounters an oath used as an intensifier, damn, the two coincidentally resembling each other. A kind of secondary synonymy grows up whereby darn = down acquires an occasional -ed so that darned matches damned as darn matches damn. A twin star can develop by fission or by capture. The latter seems to have been the process here. If correct, this at least bestows an initial innocence on darn, however shady the later company it kept.